Lacking in financial support, queer students struggle to get hired and pay back their student loans. LGBTQ students report $16,000 more debt on average than their heterosexual peers, according to a survey of 11,000 students conducted in February. The study, conducted by Student Loan Hero, found that LGBTQ borrowers reported higher levels of debt, particularly student loans, which they found more unmanageable than the general population. “Your degree is not working for you in the same way as it’s working for other people, and then it’s compounded if you’re a person of color, have a disability or are an immigrant," Olin Winn-Ritzenberg, a youth education services coordinator at The LGBT Community Center in New York, told CNBC. Members of the queer community who took out loans regret the decision 15 percent more than their cisgender and heterosexual classmates. Student Loan Hero, an online resource for borrowers to manage their student loans, found that while only 13 percent of male-identified borrowers found their debt unmanageable, 28 percent (more than double the amount) of women and LGBTQ students felt the same. The data supports the narrative that being part of any marginalized community adds barriers to pursuing a college degree, graduating, and finding a gainful and steady job with that diploma, all of which impact the repayment of student loans. For some queer students, the debt is a result of a lack of family support; according to a 2013 study from the Pew Research Center, nearly half of LGBTQ adults say that they were rejected by a family member or close friend because of their sexual orientation or gender identity. Often that rejection includes pulling the plug on providing financial support before, during, or after college. 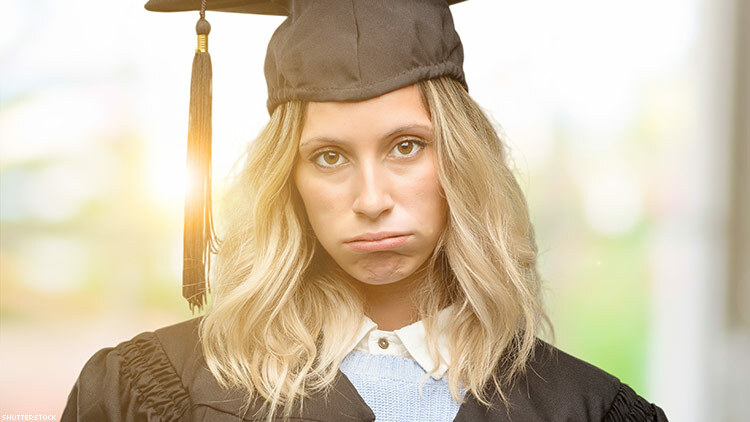 “When there’s less parental involvement or support, students are much less likely to fill out a FAFSA [the required form most schools use to determine financial aid], and will have a hard time even getting student loans or turning to private student loans,” Todd Christensen, the education manager at the nonprofit Debt Reduction Services, told CNBC. This makes scholarship providers like the Point Foundation, which provides grants to LGBTQ students, so imperative. Executive director and CEO Jorge Valencia told CNBC that the Point Foundation receives more than 2,000 applications a year for the maximum of 30 scholarships they bestow. Of those applicants, “41 percent report that they delayed their educational pursuits because of the cost of education and because they didn’t have familial support,” he noted. These challenges are exacerbated by discrimination the queer community faces in the workforce. “We take on more debt to subsidize college, and then can’t get a job that’s commensurate to the amount of debt we have,” John Schneider, co-owner of DebtFreeGuys.com, an LGBTQ-oriented personal finance site, told CNBC. LGBTQ professionals surveyed by Student Loan Hero reported lower incomes than the general population. Meanwhile, the unemployment rate for queer workers is higher; in 2015, the National Center for Transgender Equality and National LGBTQ Task Force reported twice as many gender non-conforming individuals were out of a job. In 2017, Out & Equal reported that 25 percent of LGBTQ employees have faced discrimination in the past five years, with 10 percent leaving a job due to the hostile work environment. “Employer discrimination is an issue that ultimately translates into a financial issue,” said Michael Adams, CEO at SAGE, which advocates and provides service for LGBT elders on a national level.